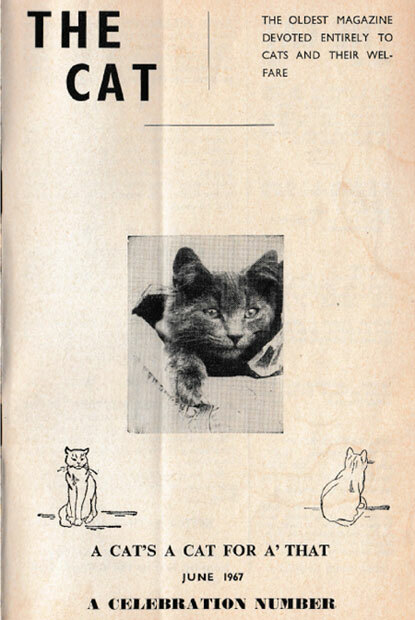 Cats Protection’s official magazine, The Cat, recently celebrated the conclusion of its 85th year in print. To put that milestone into perspective, that’s only nine years shy of Reader’s Digest’s lifespan, eight years short of Time Magazine’s run and two years longer than Newsweek has been in circulation. 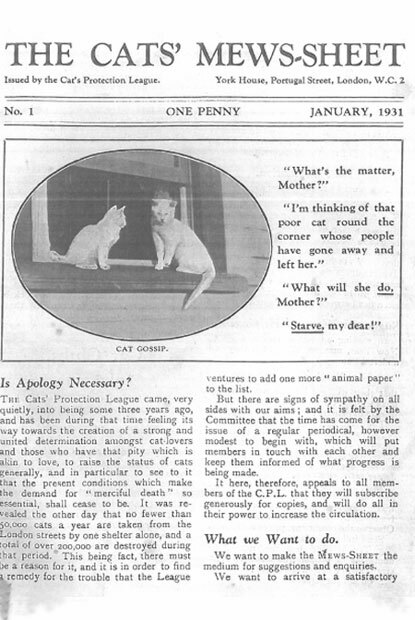 Throughout this time the publication, which was initially entitled The Cats’ Mews-Sheet, has informed, entertained and aided its feline-loving readers against the backdrop of a constantly-changing world, ensuring the welfare of cats has remained on the agenda during some of the most turbulent times in recent history, including the Great Depression and the Second World War. Continue reading to discover how the publication has evolved – 15,112 pages and 680 issues later – into today’s glossy, full-colour coffee-table magazine and to find out how you can subscribe to its variety of news, views and feature articles for just £15 a year. 1931: The Cat’s Mews-Sheet is launched in January to spread the word about the pioneering work of the Cats Protection League’s handful of clubs. The four-page, black-and-white A5 publication aims to “create a medium for suggestions and enquiries; to obtain the co-operation of the other animal societies and to educate the public.” Importantly, it also helps raise the profile of the three-year-old charity and provides a sense of unity for its growing membership. 1934: The loss-making monthly publication, which would be edited by Cats Protection founding member Jessey Wade until March 1935, makes its first significant changes. After adopting its current name, doubling its page count and increasing its cover price to two pence in January, it introduces adverts a month later. 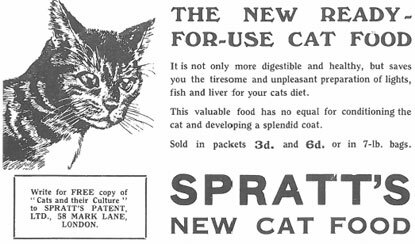 Spratt’s ‘new, ready-for-use cat food’ pounces on the opportunity to market its ‘more digestible and healthy’ wares. 1939-45: The advent of the Second World War forces a reduction in page count and the removal of all images from October 1939. Importantly, however, The Cat doesn’t miss one issue during the conflict and its recipes and tips ensure that cats in the UK are cared for in spite of the food shortages. 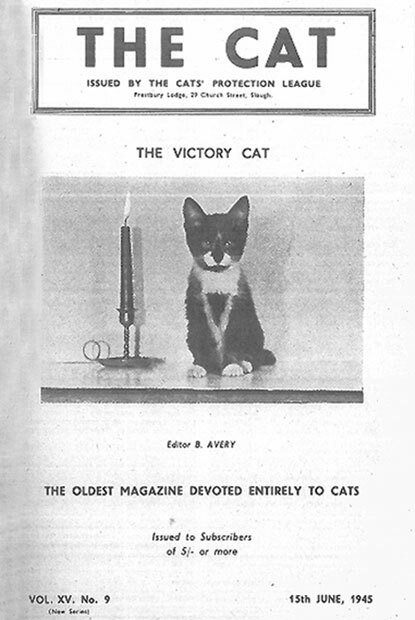 When the cover image is reinstated in June 1945, it is accompanied by an image of ‘The Victory Cat’, an adorable tuxedo kitten sporting a white ‘V’ on his chest. 1950s: From 1951, the number of issues published annually is reduced to 10 in order to save on printing costs. Standout content includes excerpts from literary works of interest to cat lovers. One of the authors allowing the magazine to print their work is film star and devoted cat lover, James Mason. 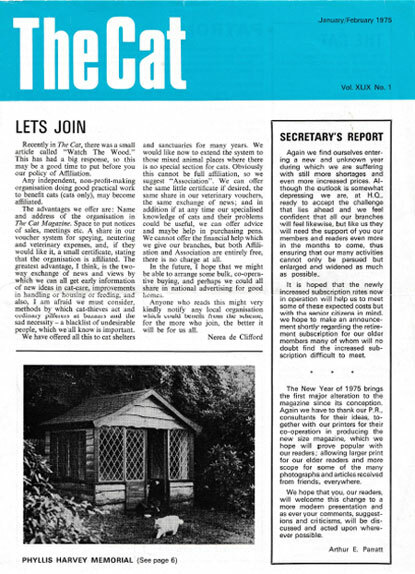 1967: June’s issue of The Cat is deemed ‘a celebration number’ in recognition of the charity’s 40th anniversary. The issue includes a special, four-page feature to mark the occasion. Two years later the magazine grows by four pages but becomes a bi-monthly publication to ensure its costs remain within the Cats Protection annual subscription. 1975: The January/February issue sees The Cat stride confidently into a new A4 format, complete with a colour front cover. 1980s: The November/December 1984 edition introduces a page devoted to subscribers’ tributes to well-loved cats, a feature that can still be found in the magazine today. 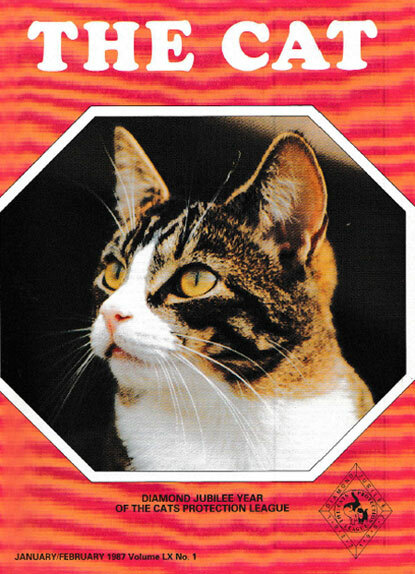 Two years later, in the January/February 1987 issue, The Cat takes another leap forward, celebrating the charity’s diamond jubilee year by featuring a colour photograph on its cover for the very first time. 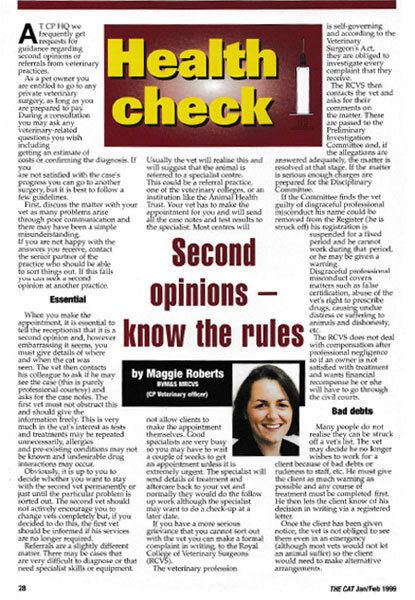 1990s: Regular news stories from Cats Protection branches and adoption centres are supplemented by more general features for the first time since the Second World War. Articles with subjects as diverse as feline welfare in Israel and cat-themed postage stamps are later joined by insightful pieces from veterinary experts covering feline medical and behavioural issues. 2007: Two years on from increasing its page count to 68 and becoming a quarterly publication, The Cat celebrates Cats Protection’s 80th anniversary by adding cat-loving celebrity interviews to its increasingly varied content. 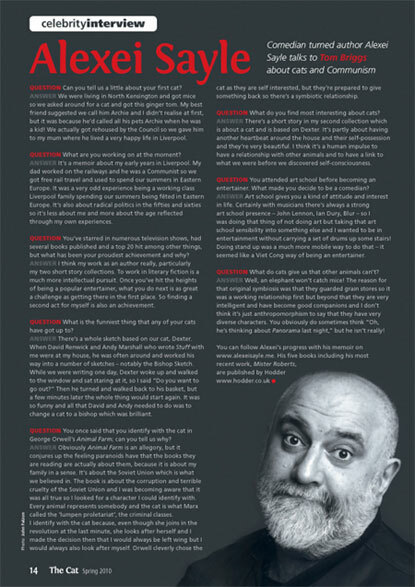 Entertaining chats with well-loved personalities including Prunella Scales, David Baddiel, Miranda Richardson and Alexei Sayle all help to raise the charity’s profile. 2008: The Cat’s spring issue sees the magazine transformed into the glossy, coffee-table publication available today, complete with full-colour front cover and distinctive, full-width title on a white background. The next issue of The Cat magazine, issue number 681, will drop onto the doormats of Cats Protection supporters this summer. 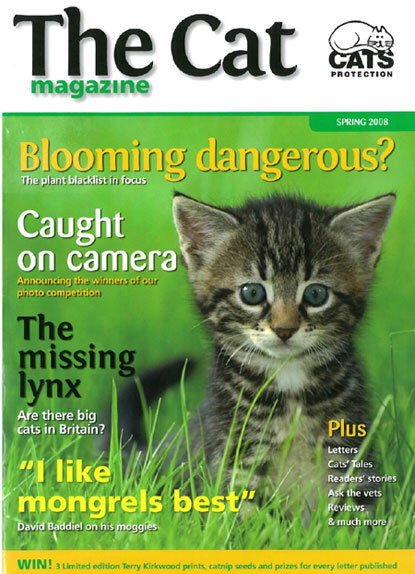 If you’re after reviews of the latest feline-related products, expert advice from vets and behavioural specialists, the chance to discuss cat care issues with other subscribers, and a lot more besides, we believe the annual subscription fee of £15 for four issues totalling over 250 pages represents great value. What’s more, it all goes towards helping us care for unwanted cats and kittens. To find out how to subscribe to The Cat, by post, by telephone or online – and to view samples of previous issues – click here. We look forward to welcoming you to the next chapter in our magazine’s exciting journey! Covers of The Cat magazine belong to Cats Protection.